I've always wanted to go to Vigan eversince I saw a picture taken at Calle Crisologo. And this wanting grew more when I saw a scene taken at the same location in one soap opera - I heart u Pare. We reached Vigan around 615am on the 5th of June 2011 (my birthday!) and was dropped off in front of a church - Apo Santo Kristo In SImbahan Bassit - so we decided to attend the first mass. Starting my birthday with a mass- i feel so blessed- though it was an Ilocano mass ( we didnt quite understand it - but what's important is we PRAYED). After hearing the mass, we're still thinking how to go to Calle Crisologo and have breakfast (since we're already starving hehe) when a tricycle driver approached us and asked if we want to have a day tour at the cost of Php150/hr. We haggled and agreed at Php100/hr. 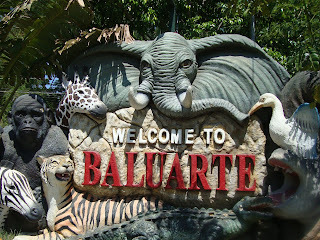 (Day Tour started @ 8am - Contact Person: Kuya Roger ctc# 0926-4324954) First destination in mind - FOOD place/resto! :) But Vigan's Pagburnayan is along the way, we stopped to take a pic..i mean to take a peek :) The man doing the hand pottery wasn't there at that time so what we did was - SHOP! We bought t-shirts and some handicrafts. Afterwhich, its really time to break the fasting and have a Vigan's almusal @ Hidden Garden. We tried Ilocos' longganisa, tapa and empanada - burp! I was surprised that it offers a lot - aside from seeing different animals, there's also a free ride with the "tiburin" (a small horse-drawn carriage), a butterfly garden, and an animal show - and its all FREE! Wow! What captured my attention is an animal from the middle east - The Camel! I never thought it'd see one here in the Philippines (the first time I saw one was when i visited Sriracha Tiger Zoo in Pattaya). Next stop - what I have been waiting for - CALLE CRISOLOGO- the Heritage Village of Ilocos Sur! I just love the rustic feel of the place. It's really like visiting the past..though it has become more of a souvenir shop street.. The "kalesa" matches the ancestral houses. I just hope that this will continue to be preserved and that more cultural attraction be offered on this famous calle. We passed by Plaza Salcedo and St. Paul Metropolitan Cathedral then visited the Bantay Bell Tower. Then our tour continued - destinations- Crisologo Museum, Syquia Mansion Museum and Tongson's Royal Bibingka store. We ended at 4pm - and it was quite a fun filled day tour! Sa October babalik akong Vigan... di ko pa napuntahan ang Lost Garden kasi. :) Welcome to the blogosphere, te Cha!